Denomination : Silver Penny. 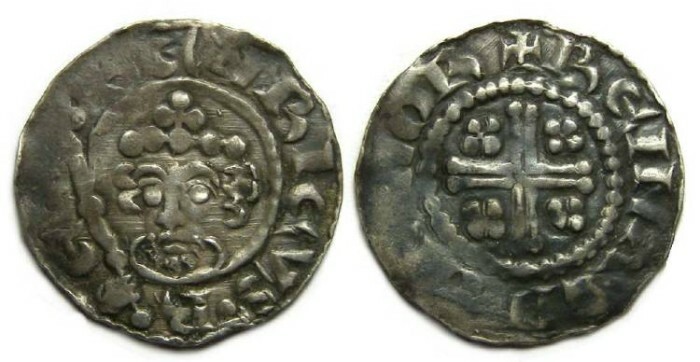 Mint and Moneyer : Northampton, Reinald. Date : Class 1b, issued between AD 1180 and 1189. Size : 20.0 x 20.4 mm. Weight : 1.41 grams. Grade : VF but weak on one edge where some of the inscription is weak but all letters can be read if you look closely. The edge of the weak area has the appearance of a slight crease, but I believe that is how the coin was struck. Obverse : Facing bust of Henry II, with HENRICVS REX around (some of the letters are weak at the very beginning and end of the inscription). Reverse : Short cross with small quadrafoils in the angles, with REINALD ON NOR around, with just a few letters in the middle of the inscription weak.